Envirogadget Competition – win an Eco-Friendly iPhone Case! We’ve got a competition for you on EnviroGadget, and it’s really easy to enter. We have 2 prizes available, therefore there will be 2 winners. Each winner will get 1 prize. When you enter, you can choose which prize you’d prefer. 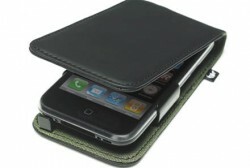 We have the Proporta Hessian and Recycled Leather Eco-Friendly iPhone 3GS Case worth £29.95. 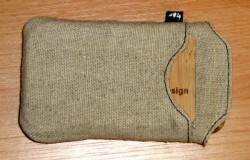 We also have the Proporta Hessian iPhone 3GS Pouch Case, worth £19.95. It’s really easy to enter! You also get up to 2 chances to enter too! Just follow us on Twitter and retweet this competition to get 1 entry into the prize draw. Just become a fan on Facebook and share a link to this competition to get 1 entry into the prize draw. To get 2 entries, just do both! Then come back to this page, and tell us what name you used to follow us on Twitter or on Facebook. The competition closes at midnight on Monday 14th June. The winners will be selected at random once the competition has closed. Thank you for your entries, the competition has now closed! The winners have now been notified. The winner will be chosen at random, and the case will be posted to them. The cases offered as prizes are the ones used in the above mentioned reviews. We’ll do our best to ensure safe delivery of the prizes, but we cannot be held responsible for any delays or problems that occur in the postal network. No country is excluded from this competition. Anyone can enter!